Hard Rock International has announced it is to build two new hotels in China in conjunction with a leading global golf brand. The company is collaborating with Mission Hills Group, with the hotels combining Hard Rock's famous rock 'n' roll design features and guest amenities inspired by music history with the Mission Hills style. And Hamish Dodds, president and CEO of Hard Rock International, thinks people in China will love the end results. 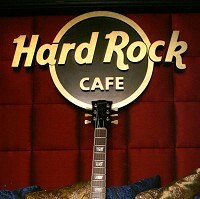 He said: "The expansion of Hard Rock Hotels into China is a momentous event. We couldn't ask for a better partner than Mission Hills and are excited to share Hard Rock Hotel's unique style and attitude with a Chinese population thirsting for new entertainment experiences." The 10-acre, 22-storey, 280-room Hard Rock Hotel in Shenzhen will have a fitness centre, signature restaurants and even a recording studio and nightclub. Meanwhile, the 250-room Hard Rock Hotel in Haikou will be set in more than eight acres on tropical Hainan Island and will feature some world-class golf elements, so make sure your sports travel insurance is sorted in time for the opening in 2015.